The selfie is quickly becoming one of the most prominent ways to take a portrait. Thanks to the wide-angle view of your GoPro, the camera lets you create some interesting moving or still selfies. Make the shot flattering. More appropriately, keep it from becoming unflattering. The GoPro’s wide-angle lens can distort your appearance, and holding it too low and close to your face can make your nose look like a weapon. Instead, hold it at just above eye level, perpendicular to the ground. Know yourself. What’s your good side? If you know it, make sure that you shoot it. Make sure that the light works. Opt for soft directional light, as shown. Also, make sure that the background is not busy or too bright. Mount the camera on an extension pole. You can make a fun shot by extending the camera at an angle above you or your group with the GoPro 3-way or the Handler. Shoot on Burst. Press the shutter once and get a bunch of shots. This works especially well with group selfies and can improve the chances that everyone has a flattering expression. Use your smartphone as a monitor. Here’s something a little different: Hold the GoPro and keep your smartphone in view so that you have some idea how the shot will turn out. 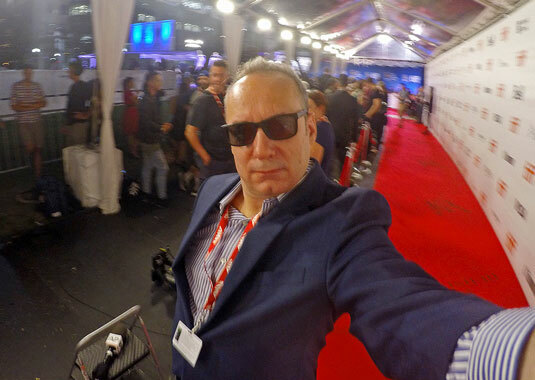 A GoPro selfie taken on a red carpet.